Lanrick: A Game for Two Players. Maçia, Paris 1879 - In-folio (447 x 345 mm), titre, (2) ff., (98)ff., 96 pp., monté sur onglets, reliure de l'éditeur polychrome, demi-chagrin rouge, dos à nerfs et plats de toile chagrinée richement décorés, blason de la ville de Vizeu au Portugal sur le plat supérieur, doublure et garde imprimées, tranches dorées. Reproduction d'un manuscrit enluminé datant de 1610, ornée de chromolithographies, dont le titre, 10 planches, une grande vignette, des lettrines et des encadrements de texte. Suivi de "De la Peinture des manuscrits en Portugal", et de la description d'un "Poëme français du XVIe siècle, orné de belles miniatures, exécutées vers l'année 1550, et représentant des brésiliens". Bel ouvrage. (malgré des défauts d'usage, frottements sur les coiffes, le dos, les charnières, coins usés, discrète dédicace manuscrite sur le premier feuillet blanc, datée de 1899, rousseurs). // Folio (447 x 345 mm), title, (2) ff., (98) ff., 96 pp., bound with guards, polychrome editor binding, red half-shagreen, spine raised on bands and cloth-shagreen covers richly decorated, blazon of Vizeu in Portugal on upper cover, linings and end-papers printed, gilt edges. Reproduction of an illuminated manuscript of 1610, illustrated with chromolithographs, including title, 10 plates, a large vignette, letters and tooled borders for the text. Followed by "De la Peinture des manuscrits en Portugal" (about painting of manuscripts in Portugal), and with the description of a "Poëme français du XVIe siècle, orné de belles miniatures, exécutées vers l'année 1550, et représentant des brésiliens" (french poem of 16th century, illustrated with nice miniatures, painted near 1550, and depicting Brazilians). Fine copy. (despite defects of use, rubbings on spine, on top and bottom, on hinges, corners used, a discreet handwritten dedication on the first blank leaf, dated 1899, foxings). MAXWELL'S "EXPLANATION OF THE PROPERTIES OF A GAS IN TERMS OF THE BEHAVIOR OF THE ENTIRE 'ENSEMBLE' OF ITS MOLECULES" (Wenner Collection). This is the third and least well-known of Maxwell's three great papers the subject and historians claim that the ensemble theory was important to statistical mechanics well beyond that of gases. Although it was formulated in classical terms, the ensemble theory provided an infrastructure still valuable in quantum statistics because of its generality (Inaba, A New Glimpse at the History of Statistical Mechanics, 1). This paper was first published in 1879 (the year of Maxwell's death) in the Transactions of the Cambridge Philosophical Society. In this paper, James Clerk Maxwell, observing the properties of dynamical systems, here applies statistical techniques to the consideration of the probability of a given system being in a particular state. His work, today referred to as the Maxwell-Boltzmann distribution, was integral to the development of a statistical means of describing the distribution of the kinetic energies of ideal gas molecules. In this same paper, he "proved that the densities of the individual gases in a rotating mixture of gases are the same as if each gas were present by itself, suggesting that a centrifuge could be used to separate gas mixtures, a technique in frequent use" (Wenner Collection). Generally speaking, the idea behind the ensemble concept is that averaging among the many states of a molecular system can be done conveniently by imagining a large collection - an ensemble - of replicas of the system, with the replicas all exactly the same except for some key physical properties" (Cropper, Great Physicists, 195). The ensemble concept greatly simplified analysis of gas behavior. "Among Maxwell's last innovations before his death in 1879 was the introduction of the notion of ensemble averaging as a device for solving statistical problems. From a probablistic point of view, the problem was to understand the meaning of the averages and of the probabilities that played such an important role in going from microscopic to macroscopic physics. "Maxwell's technique was, first of all, to employ Hamilton's formulation of the Newtonian equations, which used both the position coordinates and the momenta of particles as the fundamental variables to be tracked during their motion. This had the advantage that knowing both positions and momenta of particles at one instant allowed the complete prediction of their future motion&hellip; "The next step was to introduce an ensemble, an infinite collection fictitiously made up of systems all of the same kind and the same energy but with different initial conditions (different starting positions and momenta compatible with the same total energy). In order to calculate, at a given instant tof time, the probability of finding any specified property of the molecules - for example, a given distribution of speeds - one simply needed to determine the fraction of the members of the ensemble whose molecules had that property, and similarly for averages" (Newton, A History of Physics, pp. 177-178). CONDITION & DETAILS: London: Taylor & Francis. (8.5 x 5.5 inches; 213 x 138mm). Complete. , viii, , 4. Seven plates and in-text illustrations throughout. Bearing only a small penciled notation on the title page. Handsomely, solidly, and tightly rebound in three quarter brown calf over marbled paper boards. Five gilt-ruled raised bands at the spine; gilt armorial devices in the compartments. Gilt-lettered red and black morocco spine labels. Bright and clean. Near fine condition. London: Published For the Author By R. H. Porter Issued in parts from 1879 to 1882. 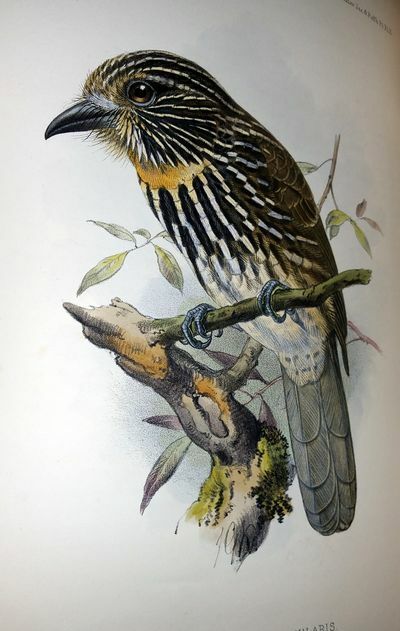 171 pages, plus 55 hand colored lithograph plates, by J. G. Keulemans. 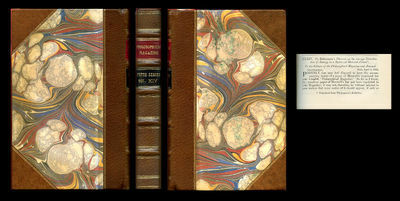 Bound in contemporary half leather, with raised spine bands and gilt stamped lettering. Top edge of text block is gilded. Marbled paper over boards, and marbled end leaves. Rubbing on lower edges and light wear to corners. Book plate on front paste down. About eight plates with light foxing. Volume is otherwise tight and clean, and plates remain very bright and lovely.. First Edition. Half Leather - Hardbound. Very Good/No Jacket. Illus. by J. G. Keulemans. 4to. 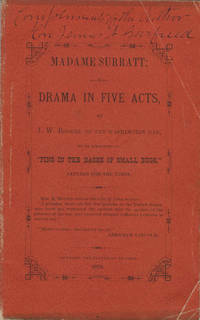 Garfieldâ€™s copy of the rare first edition of â€œMadame Surratt,â€ a drama about the suffering of the nation after Lincolnâ€™s assassination â€“ presented by the author to Garfield just two years before his own assassination. THE SEASONS: A ROMAN IDYLL?WINTER - Alma-Tadema. THE SEASONS: A ROMAN IDYLL?WINTER (THE BLUE OF COLD)Staalgravure uit 1879 van de hand van Auguste Blanchard naar het schilderij (Opus CLXXII) van Sir Lawrence Alma-Tadema. Met potlood gesigneerd door Blanchard en Alma-Tadema. In de tijd met de hand gekleurd. H x B: 13,5 x 33 cm.Dit is de eerste gravure naar een serie van vier schilderijen die de seizoenen voorstellen. We zien een arme familie in blauwe en donkere kledingstukken, samengekropen om een sobere maaltijd te gebruiken. Alma-Tadema was aan de serie vermoedelijk begonnen tijdens zijn bezoek aan Rome in het begin van 1876.Een recencent van de Royal Academy was vol lof: "At the foot of one of the columns of a gallery or porch are three women round a brazier, who beguile the time by conversation and a mess of some sort, which one of them stirs on the fire and another tastes. Auguste Blanchard"s engraving share in this design is perhaps the picture"s greatest triumph. The purity of the subdued tones and the texture of the marble base of the column that forms the background by the side of which we have a glimpse of the snowy landscape, are beyond all praise. 'Â Prijs: â‚¬ 1.250,- (incl. lijst). 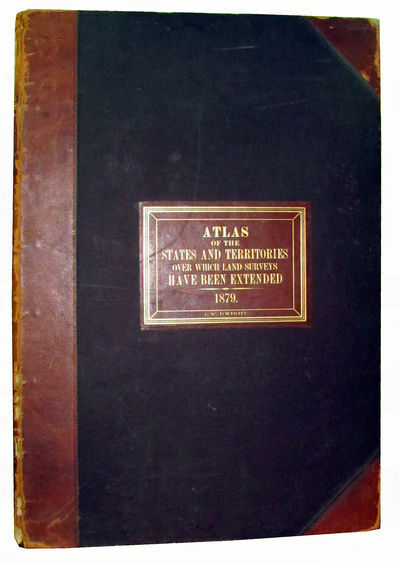 Atlas of the States and Territories Over Which Land Surveys Have Been Extended. Washington, D.C.: General Land Office. 1879. Hardcover. Index + twenty-nine double spread lithographed linen backed maps, each with its own leather tab. Original brown half calf with large calf label lettered in gold on the front panel. This copy made for Republican Congressman Jeremiah W. Dwight of New York, with his name lettered under the title and his signature in pencil on the lower right corner of the first map. A scarce atlas that includes the Western states, territories, and Indian territories. The front joint is tender, wear to extremities, spine worn and missing about an inch at heel. Internally very clean. A very good copy. Phillips 1405. .
Bayern - Schmid, Hermann von. Das Königreich Bayern. Seine Denkwürdigkeiten und Schönheiten mit Beiträgen von R. Gadermann, B. Grueber, Fr. Lampert, Hrch. Noé, C. von Spruner und mit Bildern namhafter Künstler. Zwei große Vorstellungen des bis jetzt noch unbesiegten und preisgekrönten bayerischen Herkules Hans Steyrer. (Unterzeichner:) Heinrich Herzog, Direktor. Philadelphia, 1879, 8vo mezza pelle, titolo al dorso, pp. 316 con 112 tav. lit. (in gran parte a colori) "The 1st series of the Manual of Conchology, is a great rarity. Only about 65 (of 250) copies were sold to the general public". Il primo volume ? il pi? raro di tutta la serie. Die Kunst der Fliegenfischerei auf Forellen und Aschen in Deutschland und Oesterreich. Mit einem (kolorierten) Titelkupfer und 4 (kolorierten) Tafeln mit Abbildungen der ausgesuchtesten künsstlichen Fliegen (und einigen Textabbildungen). Bernhard Friedrich Voigt, Weimar 1879 - Weimar, Bernhard Friedrich Voigt, 1879. 2014,3 cm. X, 180 S. Neuer Ln.-Bd. mit Rückentitel. (Rücken verblasst. Schönes Exemplar). London: Pickering and Co, 1879. 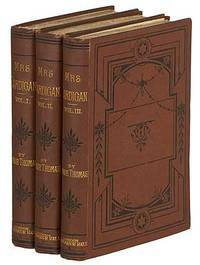 Second edition, substantially enlarged, of this unusual bio-bibliography of Tennyson, the copy of Tennyson's friend Edward Lear, and later of poet Siegfried Sassoon. Shepherd lists Tennyson's works, and offers chapters on the poet's classical allusions, versification, and portraits. This second edition, following the first edition of 1866, is revised and enlarged by about one third. Introduced to the Tennysons through a mutual friend, illustrator and nonsense poet Edward Lear had been devoted to the poet's work for years. In a note accompanying his wedding gift to the couple, Lear confessed to the bride, "There have been but few weeks or days within the last eight years, that I have not been more or less in the habit of reading Tennyson's poetry, and the amount of pleasure derived by me from them is quite beyond reckoning." Lear's wedding gift to the Tennysons was a copy of his Journal of a Landscape Painter in Greece & Albania (1851), the work that inspired Tennyson's "To E. L., On His Travels in Greece." Lear worked for 35 years on a series of illustrations to Tennyson's poems, published two editions of Tennyson's poetry set to music, and named his own house Villa Tennyson. Upon Lear's death, Tennyson issued a signed limited edition of his own work illustrated by Lear, and Tennyson's poetry provided the epitaph for Lear's tombstone. This copy later belonged to the World War I poet-soldier Siegfried Sassoon; his bookplate was tipped-in posthumously when his library was sold. A near-fine copy with fascinating provenance. Octavo, original green cloth, printed paper spine label, text block uncut. Ink ownership inscription, "Edward Lear, Augt 14 1880," to title page; penciled bookseller notes and bookplate of Siegfried Sassoon to front pastedown. Small chips to spine label, endpapers toned, minor spotting to lower board. GRIMM, Brothers [Jacob and Wilhelm]. THE GRIMM FAIRY LIBRARY. Ten volumes. The Three Brothers. The Donkey Cabbages. Clever Alice. The Golden Bird. Snow White and Rose-Red. The House in the Wood. The Old Woman in the Wood. The Goose Girl. The Almond Tree. The Soaring Lark. Ten volumes. each with a coloured frontispiece and line drawings within the text; each bound in a decorative coloured cloth, gilt. Octavos. Contained in a cloth box with a pictorial gilt decoration to the lid, and a paper label, detailing the contents, to the underside of the lid. Some volumes with signatures that are loosening; joints strained; box restored, with one plain side and the lip replaced; else very good. Extremely scarce, and rarely found in the original box. The Hans Andersen series of fairy tales, issued by Routledge at the same time, is far easier to obtain. Maçia 1879 In - folio (447 x 345 mm), titre, (2) ff., (98)ff., 96 pp., monté sur onglets, reliure de l'éditeur polychrome, demi - chagrin rouge, dos à nerfs et plats de toile chagrinée richement décorés, blason de la ville de Vizeu au Portugal sur le plat supérieur, doublure et garde imprimées, tranches dorées. Reproduction d'un manuscrit enluminé datant de 1610, ornée de chromolithographies, dont le titre, 10 planches, une grande vignette, des lettrines et des encadrements de texte. Suivi de "De la Peinture des manuscrits en Portugal", et de la description d'un "Poëme français du XVIe siècle, orné de belles miniatures, exécutées vers l'année 1550, et représentant des brésiliens". Bel ouvrage. (malgré des défauts d'usage, frottements sur les coiffes, le dos, les charnières, coins usés, discrète dédicace manuscrite sur le premier feuillet blanc, datée de 1899, rousseurs). // Folio (447 x 345 mm), title, (2) ff., (98) ff., 96 pp., bound with guards, polychrome editor binding, red half - shagreen, spine raised on bands and cloth - shagreen covers richly decorated, blazon of Vizeu in Portugal on upper cover, linings and end - papers printed, gilt edges. Reproduction of an illuminated manuscript of 1610, illustrated with chromolithographs, including title, 10 plates, a large vignette, letters and tooled borders for the text. Followed by "De la Peinture des manuscrits en Portugal" (about painting of manuscripts in Portugal), and with the description of a "Poëme français du XVIe siècle, orné de belles miniatures, exécutées vers l'année 1550, et représentant des brésiliens" (french poem of 16th century, illustrated with nice miniatures, painted near 1550, and depicting Brazilians). Fine copy. (despite defects of use, rubbings on spine, on top and bottom, on hinges, corners used, a discreet handwritten dedication on the first blank leaf, dated 1899, foxings). Berlin, Juli 1879. - 1 S. Qu.-8vo. Drei Takte mit unterlegtem Text "Che farò senza Euridice" aus C. W. Glucks "Orfeo ed Euridice". - Die in Marburg geborene Altistin debütierte 1853 in Troppau, trat hernach in Hermannstadt auf und erhielt 1854 ein Engagement am Kärntnertortheater in Wien. In Hannover, an dessen Hofoper sie 1862 gegangen war, ehelichte sie 1863 Joseph Joachim, den "bedeutendsten Violinkünstler und -pädagogen seiner Generation" (MGG VII, 56). Von 1866 an war sie vorwiegend als Konzertsängerin tätig, gastierte in Europa und den USA und "stand in den 1870er und 1880er Jahren, zumal als Interpretin Schumanns und Brahms', in hohem Ansehen" (ebd., 61). Die Ehe der erfolgreichen Sängerin, die nach ihrem Abschied von der Bühne in den USA und zuletzt am Klindworth-Scharwenka-Konservatorium in Berlin als Gesangspädagogin tätig war, wurde 1884 geschieden. Die Kunst der Fliegenfischerei auf Forellen und Äschen in Deutschland und Oesterreich. Zweite wohlfeilere Ausgabe. Zwei groÃŸe Vorstellungen des bis jetzt noch unbesiegten und preisgekrÃ¶nten bayerischen Herkules Hans Steyrer. (Unterzeichner:) Heinrich Herzog, Direktor. München, 6. Juli (1879). - Plakat mit 2 Holzschnitten. Auf braunem Papier. 62 x 21,5 cm. 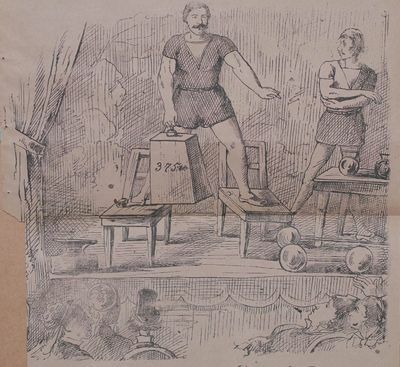 1879 suchte der Zirkus Herzog den stärksten Bayern und plakatierte diese Aktion bayernweit. Hans Steyrer (1849-1906) gewann alle Wettbewerbe und setzte zum Schluss noch einen drauf: Mit der Kraft seines rechten Mittelfingers konnte er als einziger einen 508 Pfund schweren Stein einige Sekunden lang anheben (lupfen). Seitdem wurde er "der bayrische Herkules" genannt. Ein Holzschnitt (19,5 x 19,5 cm) zeigt diese ungewöhnliche Kraftvorführung, hier noch mit einem 375 Pfund schweren Stein. - Neben dieser Auftritt, der den Ruhm des bis heute in Bayern unvergessenen Hans Steyrer begründete, traten noch eine Drahtseiltänzerin, Louise Renz mit einer Pferdenummer u. a. auf. - Untere Hälfte am linken Rand knapp beschnitten. Die Loango-Expedition, ausgesandt von der Deutschen Gesellschaft zur Erforschung Aequatorial-Afrikas 1873-1876. Ein Reisewerk in drei Abteilung. 3 Bände in 1. 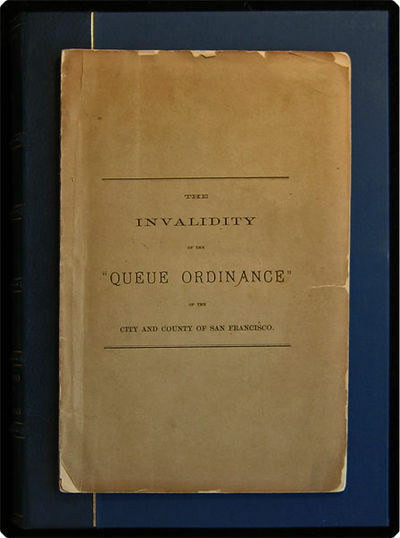 The invalidity of the "Queue Ordinance" of the city and county of San Francisco. Opinion of the Circuit Court of the United States, for the district of California, in Ho Ah Kow vs. Matthew Nunan, delivered July 7th, 1879. San Francisco: J.L. Rice & Co. 8vo (23.3 cm, 9.2"). 43,  pp.. 1879 First edition: The case in which U.S. Supreme Court Justice Stephen Johnson Field (acting as an individual jurist in district court) found that shaving male prisoners' heads, a punitive practice used particularly to discourage queue-wearing Chinese immigrants from serving jail time rather than paying fines for violating the 1870 Sanitary Ordinance, was => unconstitutional and violated the equal protection clause of the the 14th Amendment. Following the opinion is an appendix providing "history of the legislation of the Supervisors of the city and county of San Francisco against the Chinese . . . compiled by one of the counsel in the above case [i.e., B.S. Brooks] from the records of the Supervisors and the newspapers of the city." The text was printed from a revised copy, according to the title-page. Publisher's printed paper wrappers; corners and edges chipped, paper partially lost over spine, front wrapper with short tear from outer edge (not touching text), back wrapper with outer edge shortened. The whole now housed in a quarter navy morocco clamshell case with deep blue cloth–covered sides, spine with gilt-stamped title, gilt-ruled raised bands, and gilt-stamped compartment decorations. Pages slightly age-toned. => A landmark document of American Constitutional law. Australasia. With ethnological appendix by A.H. Keane. London, 1879. 8vo tutta tela originale con impressioni a secco ed in oro al piatto ant. ed al dorso, pp. XVIII-672 con ill. n.t. e tav. mappe, a col. f.t. Notes by a naturalist on the "Challenger," being an account of various observations made during the voyage of H.M.S. "Challenger" round the world, in the years 1872-1876, under the commands of Capt. Sir G. S. Nares, and Capt. F. T. Thomson. 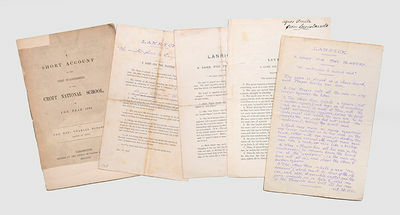 Hi, This lot is three Wisdens bound as one an 1879 to 1881 Wisden , Rebound without the original covers or the adverts. The binding is very nice like the Pelham Warner books (it could be one from his set as Vol 5 on the binding), the book inside is very clean and well presented, Buy-it-now. More Photos on request. Lewiston and Boise City, 1879. 20th-century buckram, gilt leather labels. Minor shelf wear, one label chipped. Small ink library stamp on titlepages, most with embossed blindstamp to titlepage and some other leaves, some titlepages and a few other leaves with ink ownership inscriptions. Otherwise, mostly clean texts. A nice set in good plus condition. A fantastic run of the first session laws for the Idaho Territory (which then included Montana, so this ostensibly counts as the first laws of that territory). All of these volumes are rare in commerce, including the crucial first volume, which includes the Organic Act. 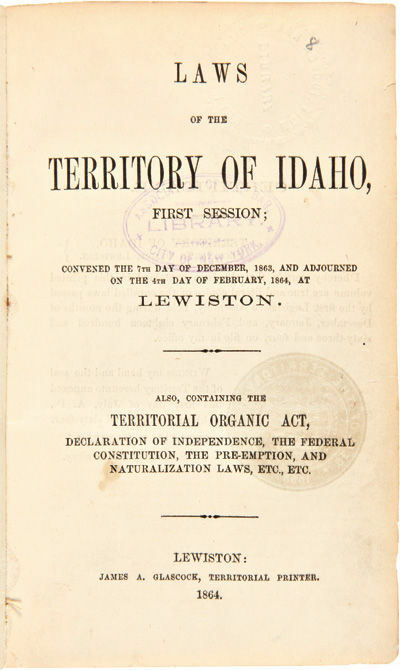 But for the eighth session, this is a complete run of Idaho territorial laws from the first session through the tenth, providing the legal foundation for the territory that would become the forty-third state of the Union on July 3, 1890. The volumes included here are as follows: 1) LAWS OF THE TERRITORY OF IDAHO, FIRST SESSION.... Lewiston: James A. Glascock, 1864. 686,xxxiii pp. Duplicate of the fourth signature present. AII (IDAHO) 16. 2) LAWS OF THE TERRITORY OF IDAHO, SECOND SESSION.... Boise City: Frank Kenyon, 1866. [iii]-viii,,516pp. AII (IDAHO) 32. 3) LAWS OF THE TERRITORY OF IDAHO, THIRD SESSION.... Boise City: Frank Kenyon, 1866. xiii,329pp. AII (IDAHO) 33. 4) LAWS, MEMORIALS AND RESOLUTIONS, PASSED BY THE FOURTH LEGISLATIVE ASSEMBLY OF THE TERRITORY OF IDAHO. Boise City: Idaho Statesman Publishing Company, 1867. xiii,- 270pp. AII (IDAHO) 39. 5) LAWS AND RESOLUTIONS PASSED BY THE FIFTH LEGISLATIVE ASSEMBLY OF THE TERRITORY OF IDAHO. Boise City: James S. Reynolds, 1869. ,-183pp. AII (IDAHO) 52. 6) LAWS AND RESOLUTIONS PASSED BY THE SIXTH LEGISLATIVE ASSEMBLY OF THE TERRITORY OF IDAHO. Boise City: James S. Reynolds, 1871. 106pp. AII (IDAHO) 62. 7) LAWS AND RESOLUTIONS PASSED BY THE SEVENTH LEGISLATIVE ASSEMBLY OF THE TERRITORY OF IDAHO. Boise City: Milton Kelly, 1873. 104pp. Original printed wrappers bound in. AII (IDAHO) 73. 8) LAWS OF THE TERRITORY OF IDAHO, NINTH SESSION.... Boise City: Milton Kelly, 1877. ,144pp. Original printed wrappers bound in. AII (IDAHO) 93. 9) LAWS OF THE TERRITORY OF IDAHO TENTH SESSION.... Boise City: D. Bacon, 1879. 92pp. Original printed wrappers bound in. Bound with the the ninth session laws. AII (IDAHO) 105. AII (IDAHO) 16, 32, 33, 39, 52, 62, 73, 93, 105. SABIN 34166. London: Chapman and Hall, 193, Piccadilly. 1879. First. First edition. Three volumes. 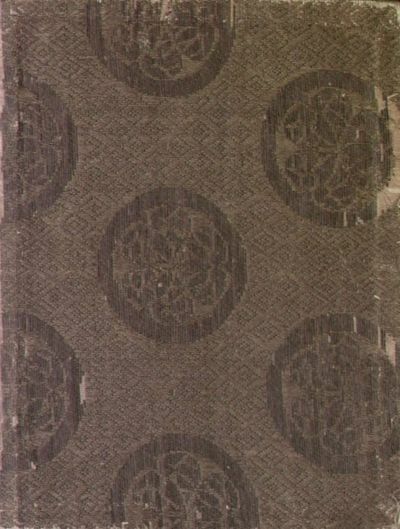 Publisher's smooth brown cloth with a decorative design blocked in black, gilt spines. A bright, fine set. A scarce first edition of this work by Thomas, one of most popular and prolific writers of romantic fiction during the Victorian era. A well-preserved set in the original publisher's cloth. 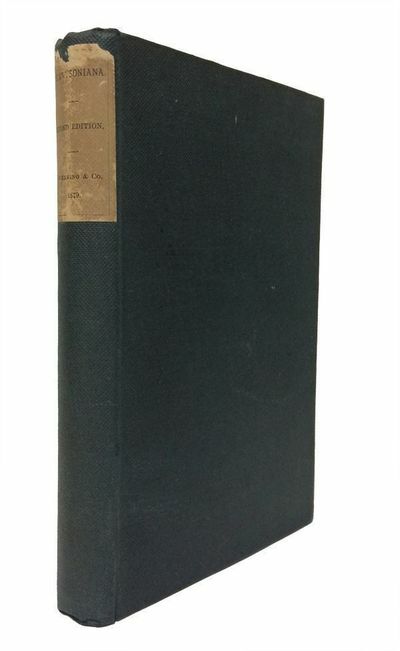 OCLC locates only 3 copies. .
Irvington: Published by the Author, 1879. 8vo, contemporary dark brown full morocco; thick boards paneled in gilt, with upper cover lettered in gilt; spine with five raised bands, ruled and decorated in gilt; board edges decorated in gilt; marbled endpapers. 58, (2) pages; 9 heliotype plates, with eight [the full complement] featuring handwritten ligatures and/or numbers. Binding rubbed, especially at spine, but sound. Very good with better interiors. An above-average copy of this classic work, with the full complement of eight of the nine plates numbered and/or with ligatures added by the author (Plate VIII features only obverses and is not seen with annotations). 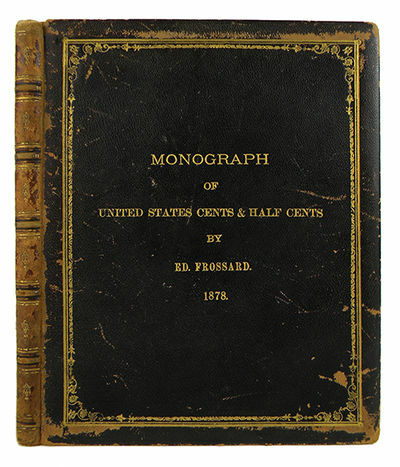 Frossard took the opportunity presented by his Jan. 3, 1879 sale of the George Merritt collection to compile this work, illustrating it with coins from Merritt's collection as well as from that of Lorin G. Parmelee. The story of the compilation of these plates is told in the September 1878 issue of Numisma, though it has been inaccurately stated through the years that the plates were initially created for use in the Merritt catalogue (they are the wrong size for an auction catalogue and depict both sides of most early varieties, using of necessity different coins-from both Merritt and Parmelee-to do so). Three hundred copies were printed (this is No. 130). The plates were intended not only to illustrate the various die varieties, but to assist the collector in learning how to grade properly: throughout the work, Frossard provides his own opinion of the grades of the pieces illustrated. The book is a good overview of both series and one of the earliest to deal with die varieties for dates past 1794. Of considerable historical importance as one of the early major works on large cents and half cents. This cataloguer has not seen a copy of this work with more authorial annotations. Davis 400. The Graphic 1879 - 20x124cm. Full superb recent colour. Excellent condition. Het Binnenhof te 's Gravenhage in plaat en schrift. Bewerkt door Arnold Ising. Tekstband + map met 20 gelithografeerde bladen. - 's-Gravenhage, H.C. Susan, C.H. Zoon, 1879. (VIII) (IV) (II) (II) (XII) 11, 24, 43, 28, 52,36, 34, 38, 31 pp. Folio. Halfleren band (34 x 48). Illustraties. *oud bibliotheekstickertje op rug en voorplat; hoeken platten gestoten; randen platten geschaafd; voorplat deels los; papier hier en daar licht roestvlekkig; hoekje eerste 7 pagina's aan onderkant licht watervlekkig; map beschadigd; marges litho's hier en daar licht roestvlekkig; enkele vloeibladen beschadigd* Map (72 x 101 cm) bevat de volgende litho's: 1. De Trêveszaal, 2. Plafond der Trêveszaal, 3. Het stadhouderlijk kwartier in 1650, 4. Rolzaal van den Hove van Holland, 5. Raadkamer van den Hove van Holland (Zaal van De Lairesse), 6. Zaal van den Hoogen Raad, 7. Zaal van Hun Hoog Mogenden, 8. Plafond der Zaal van Hun Hoog Mogenden, 9. Voorgevel der Groote Zaal in de 15de eeuw, 10. De Groote Zaal in 1651, 11. Zaal der Staten van Holland en Westfriesland, 12. Zaal van de Tweede Kamer der Staten-Generaal, 13. Kabinet van Prins Willem V, 14. Portaal van den Raad van State in 1687. Trap naar de Vergaderzaal der Staten van Holland in 1655. Hoofddeur der Trêveszaal. Trap naar de Zaal der Eerste Kamer in 1883, 15. De Poorten van den Hove I. De Oostpoort (1600). Poort van den Hoogen Raad (1640 tot 1840). Poort ten zuiden der Groote Zaal (1600). De Zuidbinnenpoort (1800). Der Middenpoort (1600). De Binnenpoort, gebouwd in 1634, 16. De Poorten van den Hove II. De Voorpoort van den Kooltuin (1400 tot 1600). De Maurits- of Grenadierspoort (1634 tot 1860). De Spuipoort (1400 tot 1861), 17. De Gevangenpoort of Voorpoort van den Hove, uit- en inwendig, 18. Gezichten op het Binnenhof aan den Vijverkant in 1598 en in 1879, 19. Gezicht in vogelvlucht van het Binnenhof in 1883, 20. Gezicht in vogelvlucht van het Binnenhof en zijne omgeving in 1616.Fraaie litho's van J.J. Meskes naar K. Klinkenberg uitgevoerd bij S. Lanshout & Co.
Nagasaki 1879, Rising Sun. Geen limp cloth, 10.5 x 14.5 cm.,. 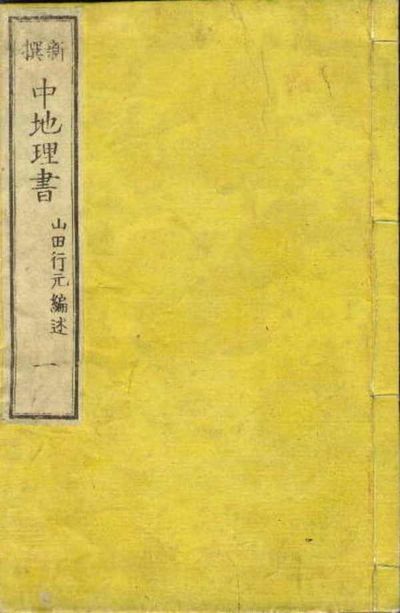 gold-stamped cover title:JAPAN AND THE LOST TRIBES OF ISRAEL. BY N. MCLEOD, 15 copper-etched illustrations, bit of minor. wear to corners, else solid. FIRST AND ONLY RARE EDITION. EARLY WRITER ON JEWS IN CHINA, COREA AND EAST ASIA: The author wrote several titles concerning the Jews and their relationship to East Asian & Southeast Asian peoples. Inquire with us for other titles in this genre. This work very similar in content to the alternate title from 1878 which has a 12 more pages that are not found in this edition. The illustrations remain the same, the one and only difference being the 12 pages, size remains identical, but this edition has the cover title, the other not. The GUIDE BOOK section is also not found in this edition. * BINDING: The book was bound in both green cloth and brown brocade cloth. The green cover has "JAPAN AND THE LOST TRIVES OF ISREAL BY N. MCLEOD" gold stamped on the cover, obviously this is NOT the title of the book though wrongly so imprinted. The title page of both copies are identical as are the contents. The size varies, but only in the amount of or lack of margin area. * ILLUSTRATIONS: The book was illustrated with copper etchings, a very unusual and rare technique of the time. * DEDICATION: Dedicated to the Rev. William Mackenzie. The author spent much time in researching & observing the Japanese to provide a description of their early origins from the Jewish people. Covering the Jewish race or Samurai of Jimu Tenno, with proofs of their identity with lost Israel and Shinto faith. Final battle of Gog & Magog. Saga insurrection, Japanese code of morals for women, Christianity, pedigree of the Princes of the Jin Dia or Jewish Race. Jin Dai or ancient characters of Nineveh and Babylon. Sanjo or, no Jinji or sacred emblems of foreign rule. Grave of the Emperors, Princes, Daimyos & Samurai. With an Abridged Guide book of Japan. *** THE AUTHOR'S IDEA OF RELATIONSHIP BETWEEN JEWS, COREANS, JAPANESE, MALAYANS, FORMOSANS &c: An extremely unusual work, covering what the author felt was the deep background of the Japanese & Coreans as coming from the ancient Jews. The writer has supported his theory with substantial research work and lucid logic! But got strange results ! . How Ainu's and Malay are diminutive race of Jews. Formosan War, agriculture and minerals, et al. . It was his firm belief, the he had discovered part of the Ten Lost Tribes of Israel in Koreans and the Japanese...."at intervals resuming business to provide the needful for this purpose..." *** AUTHOR'S BACKGROUND: Mr. N. McLeod was a Scotsman who went to Japan in the 1870's as a bookkeeper at the Scottish hong of Findlay Richardson & Co., Ltd. They went bankrupt then the author started a business of his own in Kobe & Osaka, living in the Osaka Foreign Concession. He became a missionary and abandoned his commercial enterprise for "travel and researches." * LIFE AS A MISSIONARY IN JAPAN: He became a preacher and pamphleteer, sparing neither his body, his purse, nor his mind, in the presentation of "proof" that the Koreans were descended from Japhet and the Japanese from the last king of Isreal. To that end he spent his entire savings on research and the publication of several books on these subjects. * FASCINATING BOOK: His books reflect in some cases a single sentences of 606 words, unorthodox spelling and queer punctuation, with strange notions of English grammar. Some works also contain an autobiographical account of the trials and tribulations which beset him in the pursuit of a literary career, and declarations of his own faith and beliefs in his bizarre theory. * In one of his works, he declared:"...this present edition which is only a small one, may meet with as good and ready a sale as it predecessors...." * The book is fascinating, with hardly a dull page, the lost tribes of Israel keep turning up in the most unexpected places. This title has been described as McLeod's "MAGNUM OPUS by Williams [see below for citation]. * All titles by McLeod are quite scared and now rare. The have been printed in a small number and are not common nor often found on the market for sale. * BIBLIOGRAPHY: * H.S. Williams: FOREIGNERS IN MIKADO LAND. Parts of the above have been freely quoted & summarized from pages 168-177 of this title. * Nipponalia, I 2488 * Yokohama Archives of History: THE PAUL C. BLULM COLLECTION A CATALOGUE OF BOOKS: II 1593 * International House Library: UNION CATALOG OF BOOKS ON JAPAN IN WESTERN LANGUAGES, 1968 Ed. by Naomi Fukuda p.274 * Cordier, H. BIBLIOTHECA JAPONICA: column 681, for a related title. * THIS AND ALL TITLES BY N. MCLEOD REMAIN OBSCURE. * Color scans can be sent by email. Images displayed may not always be the exact photo of the copy in stock for sale at any given time. If you want to see the exact image of the book or edition in stock today, please request this by email. . Photos of most of our books are posted to our . 4to. London: Houlston and Sons, 1879. 4to., 94 pp. Full later red morocco, gilt, by Henry Young of Liverpool, rebacked preserving gilt-panelled backstrip. Top edge gilt. Richard Holmden?s bookplate on front pastedown. Binding lightly worn, stain in top left margin of frontispiece and some scattered foxing within, all doing little to detract from the attractiveness of this uniquely embellished book. Second edition, extra illustrated with 61 plates, several coloured, several captioned in pencil, three marked as India paper proofs and two marked ?first state.? In addition to the 61 plates is the 24-page pamphlet The Political House that Jack Built, With Thirteen Cuts, Twelfth edition, 1819, each leaf separately mounted. [Tokyo] 1879, Funazu. A single Oban sheet size 23.5 x 35.5cm. print size 20.5 x 32 cm., signed & sealed in the block, very. good, beautiful colors, rebacked with tissue sheet, print. not affected. Superb work ! R A R E. A SPECTACULAR SCENE AS KOREMOCHI BATTLES THE DEVIL A spectacular acton work. Shows Koremochi falling backwards blue-blade sword flashing, as he repels the blue-faced wild haired Devil, while the autumn-red miniature Japanese maple [Momiji] leaves float in the air from the disturbance. Kore- mochi's pinkish-white cloak shows an intricate pattern carv- ed in the blocks, but printed without color by the most dif- ficult and subtle "gauffrage" technique. 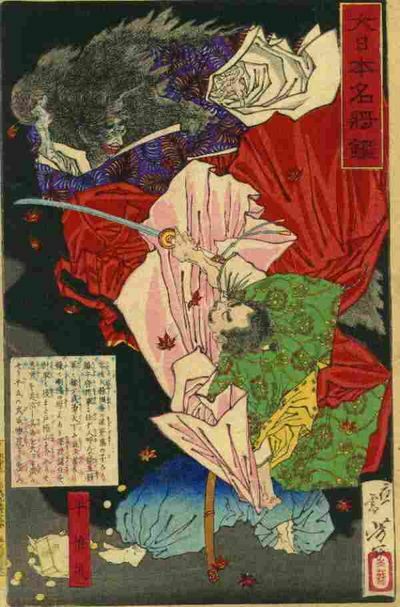 The Devil avoids Koremachi's dangerous sword in his jump into the air. A most impressive scene, suitable for framing & library display.See E. van den Inge et al: BEAUTY & VIOLENCE JAPANESE PRINTS BY YOSHITOSHI 1839-1892, p.116 & example prints from this ser- ies. Also illustrated in Divine Dementia as no. 84. Yoshi- toshi was the superb master of Samurai action and dramatic prints reflecting Bushido or the Samurai spirit. He excelled at this and has never been surpassed. His prints truly ref- lect the Japanese warrior spirit, many of which were banned during the Meiji era as too 'nationalistic' by the govern- ment. A color scan can be sent by e-mail. Always R A R E ! Images displayed may not always be the exact photo of the copy in stock for sale at any given time. If you want to see the exact image of the book or edition in stock, please request this by email. . Photos of most of our books are posted to our . OSON GAFU: A BOOK OF PICTURES BY OSON. [Tokyo 1879, Kobayashi]. Yellow stitched wrs., very good,. 18 x 22.5 cm.,  double-folded leaves  pages in all,. 25 double-page color woodblock printed illustrations, very. clean, a bit of transfer on some, else clean, solid binding.. A STUNNINGLY BEAUTIFUL COLOR WOODBLOCK PRINTED BOOK ! This is a famous and quite lovely color woodblock printed book. . The contents contains tender pastel views of Mt. Fuji, a bamboo stick, traditional poem written on paper tied to a tree branch, tree branches, flowers, teacup, a scene from a classical court yard with officials, iris, ceramic bottle with flowers, waves, lily flowers, fan, court noble woman at her writing desk, cranes, court noble in nature, deer, a basket with two pears and a pair of turtles. Typical and traditional classic drawings. . For a complete list of the color pages, see Mitchell p.443 & Toda pp.362-362. . Each double-page color illustration has cinnabar [red] seal/hanko/chop by the artist. *** THE ARTIST: OHSON was the 'studio' name of SAKAI Hoitsu [1761-1828], who was a very famous artist from the Edo [old Tokyo] area. Per Toda: "Sakai Hoitsu's personal names were Eihachiro and Tadayori. His names as a painter were Hoitsu, Oson, Kuzen, and others....his studio name was Ukwa-an, and his name as Hokku poet was Toryu." See Toda below . Roberts cites this artist as a celebrated Rimpa painter, son of Lord Sakai of Himeiji Castle. He studied in Kyoto, also painted in the Kano style, the under Utagawa Toyoharu he began work in the Ukiyo-e and Nanga school. In 1797 he became a Buddhist priest, spent the last 21 years of his life in seclusion, painting and studying the life and works of Korin. See below for more in Roberts. *** BOOK CONTENTS: The contents are clean and solid, there are no worming or other defects except for some transfer of color where the color oxidized over a period of 100 or more years, this is entirely natural and to be expected for a book of this age. Solidly stitched spine. The inside covers have silver-mica flecks giving this a touch of elegance and class. Two pages of introduction + a half title. 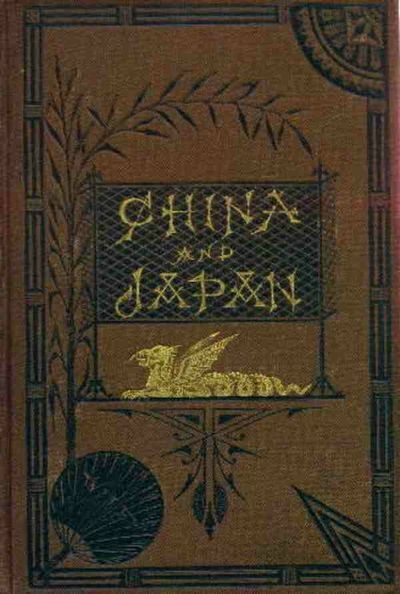 *** EDITION: This is the 1879 edition, a reprint of the Bunka 14th, 1817. edition. The preface states the Bunka date. *** CONDITION: The covers are intact with some of the usual soiling expected with yellow, blind-stamped from the inside with a floral pattern. The red cover label has some chipping on the right side, but that does not affect the title characters. Just below the upper edge of the front cover is the name of the former owner. Solidly stitched spine. *** REFERENCES: . KERLEN, H. CATALOGUE OF PRE-MEIJI JAPANESE BOOKS & MAPS IN PUBLIC COLLECTIONS IN THE NETHERLANDS: #1298, look at p.535 for "OSON GAFU", entry begins on pl534-535; and a good list of other references where this famous work can be found. * TODA, Kenji. 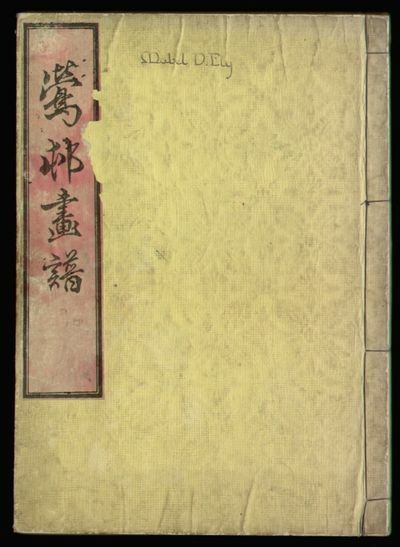 DESCRIPTIVE CATALOGUE OF JAPANESE AND CHINESE ILLUSTRATED BOOKS IN THE RYERSON LIBRARY OF THE ART INSTITUTE OF CHICAGO: pp.262-363. * MITCHELL, C.H. et al. THE ILLUSTRATED BOOKS OF THE NANGA, MARUYAMA, SHIJO AND OTHER RELATED SCHOOLS OF JAPAN: A Bibliography: pp.443-444, notes by Jack Hillier. Page 444 lists this exact copy with its description. * BRITISH MUSEUM [O.A.534] * BM , P.6 [1 vol., 1879] * BM , 16115.a.18 3 vols. 1880 * BROWN, Louise N. BLOCK PRINTING AND BOOK ILLUSTRATION IN JAPAN: p.79 * BINYON, Laurence. et al. JAPANESE COLOUR PRINTS: p.225. * ROBERTS, Laurance P. A DICTIONARY OF JAPANESE ARTISTS PAINTING, SCULPTURE, CERAMICS, PRINTS, LACQUER: p.47. * For more and copious bibliographic entries, see Mitchell and Kerlen. * Color scans can be sent by email. Images displayed may not always be the exact photo of the copy in stock for sale at any given time. If you want to see the exact image of the book or edition in stock, please request this by email. . Photos of most of our books are posted to our . SHINSEN CHU CHIRI SHO: NEW SELECTION MEDIUM ATLAS: A WORLD ATLAS & ASTRONOMY. Tokyo 1879, Fukui. Yellow stitched wrs., very good, 4 vol.. set, no title slip for vol. 3, else clean, bright copies,. hand-printed by woodblocks on hand-made mulberry paper,quite. bright, white paper, bit of old minor worming, but mended,. AN EXCELLENT TEXTBOOK FOR YOUNG JAPANESE STUDENTS text solid, 50+40+60+78 double leave pages, 6 copper-etched color folding maps, 40 fine woodcut text illustrations, most are one-half page size. Written in easily read Japanese, with Furigana along side the Kanji, balance of the text in Katakana, for the common people. * Essentially designed under the auspices of the Mombusho or Ministry of Education to enlighten Japanese students at the beginning of the Meiji era. [1867-1912]. This text is a middle-level course and resource on the basics of astronomy followed up with a comprehensive world geograhy. Enhanced by good illustrations, one of which shows the four races of man, other foreign items, including overseas lands, their strange animals and other unusual foreign things, that the Japanese have hitherto not observed. * Since the Shogun forbid its citizens to travel abroad before the Meiji era, almost no Japanese had visited foreign lands, thus there has always been a large gap in that part of their learning. Western science was also a weak area for the Japanese. During the Meiji era, this gap was a major area of focus thus the reason for this and many other books to enlighten the country. * Scans can be sent by email. Images displayed may not always be the exact photo of the copy in stock for sale at any given time. If you want to see the exact image of the book or edition in stock, please request this by email. . Photos of most of our books are posted to our . Cincinnati , Walden. Decorated brown cloth, very good,. 3 maps, 57 b.w. illustrations, 548p. S C A R C E. The author was a Bishop of the Methodist Episcopal Church. Covering the voyage from San Francisco to Shanghai, on to Peking to the North China Mission, the city of Peking, in the Southern city, Peking to Shanghai, on to Kiukiang, the mission at Kiukiang. * Shanghai to Foochow, the city of Foochow & a historical sketch. Missionary conference organized, Chinese wedding in high life, among temples, Confucius. Monastery of the bubbling spring, Foochow to Hong Kong, Canton. * On to Japan. Yokohama to Nagasaki, city of Yokohama & Tokio. With essays on Christianity in both Japan & China, the reli- gions of Japan & China, and the women of Japan & China. * Useful comparative study, also covering the people, customs, land and culture of both countries, with a missionary report on the progress of the Methodist Episcopal efforts there. * A color scan can be sent by email. Images displayed may not always be the exact photo of the copy in stock for sale at any given time. If you want to see the exact image of the book or edition in stock, please request this by email. . Photos of most of our books are posted to our . Venezia, C.Naya, ca. 1879. Original photograph. albumen print, 25,7 x 33,7 cm. KEYWORDS:italy/venezia/photo. Nouvelle Orleans 1879, Propagateur Catholique. In original. pink wrappers, 138p., slightly soiled, dusty covers,top edge. uncut, as issued, contents very clean, very good copy of a. very RARE book. FIRST AND ONLY EDITION RARE. LAFCADIO HEARN'S VERY RARE FIRST WRITING IN BOOK FORM Hearn's FIRST WRITTEN BOOK, and his second written item is very RARE! Almost never found on the market, this item is illustrated & described in Perkins, p.1. Fore edges trimmed, top, lower edges uncut, as per description, with mis-spelled publisher on title page. For more this his first writing to be issued in book form,please see Tinker's "Lafcadio Hearn's American Days" pp.143-146. 6 5/16 x 4.25 inches, as issued. Contains Reflexions Preliminaires, appendice: Pensees et Impressions de Marie-Atala. 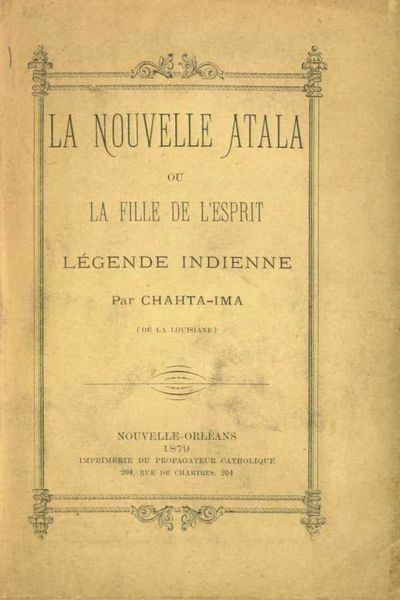 Les Deux Premiers Critiques de la Nouvella Atala. THE RAREST OF ALL HEARN BOOK WRITINGS !! Color scans can be sent by email. Images displayed may not always be the exact photo of the copy in stock for sale at any given time. If you want to see the exact image of the book or edition in stock, please request this by email. . Photos of most of our books are posted to our . Original-Ölgemälde. rückseitig handschriftlich signiert und datiert 1927, bezeichnet "Iffezheim"
Numismatische Zeitschrift. (1879 bis 1900). Herausgegeben von der Numismatischen Gesellschaft in Wien. Eilfter (Elfter / 11.) Band - Jahrgang 1879 bis zweiundreißigster (32.) Band, Jahrgang 1900 in 22 Bänden. Americana - 19th Century - Connecticut - Stamford - Atlas). Atlas of Stamford and Environs Connecticut. Compiled, Drawn and Published from Actual Surveys. By G.M. Hopkins, C.E. 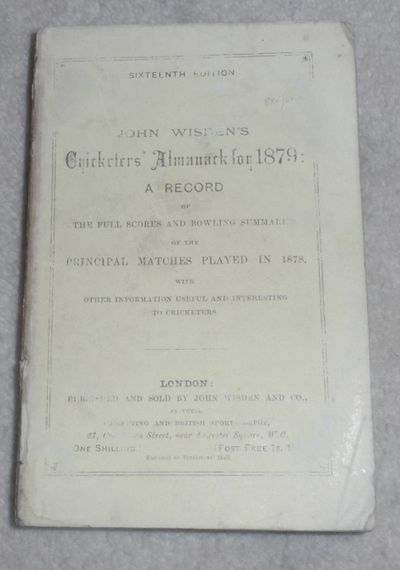 1879,1880, 1881 Wisden Cricketers Almanack - Facs Parts. This lot is a set of 3 Wisdens,1879, 1880 and 1881. This books are in paperback form with facsimile spines, covers and odd page. In very good condition, they look very nice indeed.